Hello! Lux Box Vacation Rentals is a boutique full-service residential real estate agency specializing in the management of 100+ vacation and property leases throughout the Coachella Valley. Lux Box Vacation Rentals is committed to delivering a high level of expertise, personalized service, innovation and attention to detail. 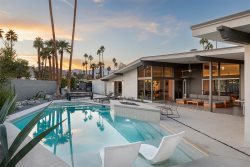 We offer Coachella Valley vacation homes and property leases ranging from stylish mid-century to designer luxe and everything in between. We are centrally located and next to the historic Sandpiper community in Palm Desert, a mid-century modern landmark designed by William Krisel, on iconic El Paseo. Our staff is here to assist you with anything you need to make your stay amazing… call us to arrange for a customized services package and quote just for you! As a dedicated full-service boutique agency, we provide customized concierge services for our vacation rental clients tailored specifically for you - Please contact us for more information at [email protected] or call us at 760.346.1154.